This activity is perfect for those with aspirations of owning a hawk some day. The activity includes an informal briefing where questions are encouraged. Guests are then taken for a 1hr hands-on and photo friendly flying session. You'll get the opportunity to fly two or more Harris Hawks out of trees to your gloved fist. 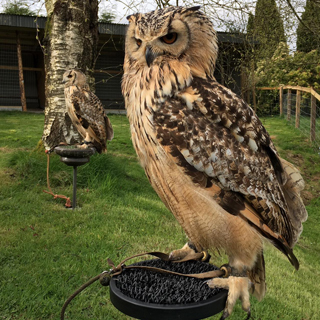 You will then observe a Falconry demonstration, a Vulture/Kite flying session and Owl Show. Your activity concludes with a photo session where you can get up close and intimate with some of the most endearing owls! The duration of this experience is approx. 2 hrs. Reasonable mobility required. Available 7 days a week, subject to availability and weather conditions. This private voucher is valid for groups of 1-6 people. Minimum participant age is 16 years. 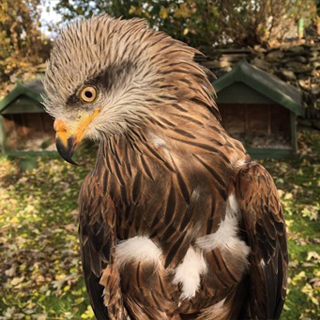 Falconry Ireland is located in Aughrim, Co. Wicklow. Advance booking on AllGifts,ie is required. We are open year round, subject to weather restrictions. How it Works: Use this gift voucher on AllGifts.ie to make a booking with Falconry Ireland. Or you can swap this voucher for any other gift or voucher listed on AllGifts.ie. Simply follow the instructions at the bottom of your voucher.